Archimandrite Ephraim of Philotheou (commonly known as Elder Ephraim, sometimes spelled Ephrem, known in the world as Ioannis Moraitis) is an archimandrite and former abbot of Philotheou Monastery on Mount Athos, spiritual guide of several monasteries on Mount Athos and Greece, and the founder of several monasteries in the United States. He resides in Arizona at St. Anthony's Greek Orthodox Monastery. Elder Ephraim has been a priest-monk for almost 60 years and has served as an elder for more than 50 years. He was a disciple of Elder Joseph the Hesychast of Mount Athos and lived in monastic obedience to him for 12 years until his Elder's repose in 1959. Elder Ephraim was born in 1927 in Volos, Greece, in the day of Nativity of St. John the Baptist, and was given a baptismal name of John (Ioannis). He grew up in poverty and helped his father at work, but always tried to emulate the pious life of his mother Victoria (whom he later tonsured a nun with the name of Theophano). He began to desire the monastic life around 14 years of age, but he did not get a blessing from his spiritual father to leave and become a monk until he was 19. Once, just a month before he left the world, his friends decided to visit elder Joseph the Hesychast. Ioannis did not have any valuable gift to send with them, so he sent a small pouch of vermicelli and wrote a note. When unpacking gifts, elder Joseph said: "This child will become a monk here". When the friends of Ioannis returned and told him these words, he just forgot it - he had no idea about his future monastic life and had no blessing from the spiritual father. When Ioannis was a little baby, his mother had a vision and understood that he will become a monk at Mt. Athos. So she was preparing him all his life, having this vision in her mind, and when he was 19, she finally decided to send him to elder Joseph. And now the spiritual father did not object as well. On September 26, 1947, Ioannis arrived at Mt. Athos to the St. Anna's skete. Elder Joseph got to know about his arrival from the patron saint of both Ioannis and of the keliya of Elder Joseph - St. John the Baptist. As elder Ephraim recalls in his book, at the pier he met Elder Arsenios who said: "Are you Iannakis from Volos?" - "Yes, how do you know me?" - "Elder Joseph knows that from the Fair Forerunner. He appeared to him today and said: I brought to you one sheep. Place it in your fence." So Ioannis became a disciple of Elder Joseph the Hesychast who tonsured him in 1948 and gave him the name Ephraim. Ephraim was subsequently ordained a deacon, and then a priest. The life in the brotherhood under Elder Joseph was very austere and ascetical, and Ephraim made great spiritual progress under his holy Elder. In his book, Elder Ephraim thanks Elder Joseph for his severe but very proficient teaching. Only after leaving the world, Ephraim understood his very strong pride. In the world, he lived a chaste and pious life and was thinking high of himself. Only with Elder Joseph he began to see it, especially when the Elder made comments about his behavior. During 12 years, Ephraim heard his name from the Elder only twice - all other times he used only abusive nicknames. But behind his back, the Elder constantly blessed him - Ephraim got to know this later from other people. Also during confession of thoughts, Elder Joseph never spoke sharply. He described in detail the origin of thoughts and mistakes, so Ephraim thought that Elder knows him better than he knows himself. 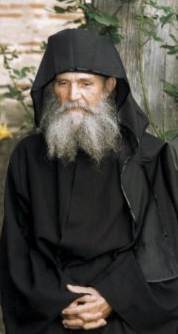 After Elder Joseph's repose in 1959, Elder Ephraim continued to live in asceticism for many years until he became the abbot of the Holy Monastery of Philotheou in 1973, where he was able to revive the spiritual life in a short time. Due to the reputation of Elder Ephraim, the monastery's brotherhood grew rapidly. Elder Ephraim was asked by the council of Mount Athos to revive and expand several other monasteries on Mount Athos which had a dwindling number of monks. These monasteries were Xeropotamou, Konstamonitou, and Karakallou. He was also asked to repopulate the Great Lavra but declined. These monasteries are still under his spiritual guidance today. Along with the monasteries on Mount Athos, there are several other monasteries in Greece under Elder Ephraim's spiritual guidance, including the monastery of St. John the Forerunner in Serres, that of Panagia the Directress in Portaria (Volos), and that of the Archangel Michael, a formal metochion of Philotheou on the island of Thasos. In 1979, Elder Ephraim became ill and needed a surgery. Then his spiritual children from Canada offered to do the surgery in Canada. The Elder agreed, the operation was successful. For more than a month Elder Ephraim stayed in America and met representatives of the Greek community. He got to know that the spiritual life in the Greek circles have been disrupted, people stayed for a long time without confession and with grave sins, were taking Communion totally unprepared, did not keep the canons of the Church. They forget the pious Orthodox life, Greek national traditions and were accustomed to vicious life. Father Ephraim decided to go to America more and more often. He first visited Canada: Toronto, Vancouver, Montreal, and then he was invited to the United States. In the end, the council of the Holy Mountain warned him that he can not continue this way and must choose: either the Holy Mountain, or America. The Elder began to pray and it was revealed that his place is in America. He decided to move to the U.S. - for the spiritual care of his flock and the revival of spiritual life in the Greek communities of North America. At first, the Synod of the Archdiocese of the Ecumenical Patriarchate in America resisted and Elder Ephraim had to seek help from ROCOR. As Elder Ephraim recalls: "I was received here with great love and genuine understanding". A year later, under personal patronage of the Patriarch of Constantinople, the problem of jurisdiction was resolved. Elder Ephraim honorably returned to his mother church and was given the right to establish monasteries in Canada and the United States. He then proceeded to establish 17 monasteries throughout North America, always after receiving permission from each Greek bishop of the area. The first monastery that was established by Elder Ephraim was that of Nativity of the Mother of God in Pennsylvania, near the city of Pittsburgh. The main monastery has the name of St. Anthony the Great and is located in the middle of the Sonoran Desert in Arizona. Here Archimandrite Ephraim resides most of the time. He arrived to the desert in 1995 with 5 monks. There was no electricity, no water, no building materials. But the Elder was not afraid of difficulties and urged the brethren not to despair and believe in God. He said: "We came to build the temple and the monastery and, for our diligence, God will bless our work". Soon people began to donate money and materials, the main church was built in just 4 months. The whole territory was planted with olive and citrus gardens. Elder Ephraim has a reputation of being a grace-filled confessor and true Athonite elder and has thousands of spiritual children around the world: monastics, clergy, and lay-people. He is considered by many to be the first to establish an authentic Athonite monastery on American soil. As of 2005, Elder Ephraim has founded seventeen monasteries in the United States and Canada under the Greek Orthodox Archdioceses of America and Canada; this includes monasteries for women and for men. (Russian) Hierodeacon Nikon (Gorohov). St. Anthony Monastery in Arizona (part 1). This page was last edited on November 1, 2013, at 16:07. This page has been accessed 129,331 times.